The holidays aren't complete without ugly Christmas sweaters — those cheap, garish tops that bring as much itchiness as warmth and often feature a poorly-knitted image emblazoned right on the front. These sweaters have become synonymous with holiday parties all over the world but, until now, their fun stopped where your pants began. At long last, shoe retailer Brooks has released a new design: a sneaker designed to look like ugliest sweater of all. The sneaker is a real, functional running shoe, but with the added bonus that it's colored red and green for the holidays. 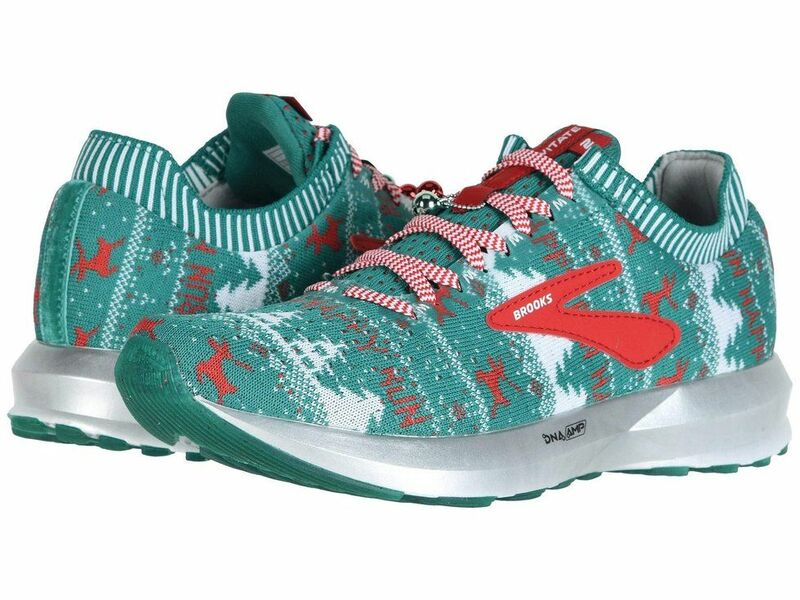 The shoe features images of reindeer playing their "reindeer games," as well as "drifting snowflakes" around the sock-liner, Christmas trees, and the words "Happy Run." All of these elements are perfectly held together by a pair of fashionable candy cane laces. The shoes are available for $150 from Brooks but, if you're interested, you'd better hurry — they're nearly sold out on Brooks' website. Happy Holidays, from our shoes to yours!